Radio Station Alice put on their annual free Summerthing Concert in Golden Gate Park at the renamed Hellman Hollow (formerly known as Speedway Meadow) Thousands came to check out the lineup featuring Vicci Martinez, Graffiti6, Scars on 45, Boys Like Girls, and Adam Lambert. What more can you ask for on a Sunday afternoon, picnic? food trucks? giveaways? quality time with friends? live music? and girls screaming at the top of their lungs? I can do without the screaming. It always boggles my mind as to why people actually scream when they see their favorite musician or singer. Maybe clapping is a good response to saying that some musical artist has done a good job is good, but screaming, I could never understand. Please spare my ears so I can actually listen to the music. The performances were lively, but unfortunately the artists were out of my element of familiarity. At most each artist performed only one of their more popular hits. Nevertheless, the show was entertaining and seeing that the crowd was really into it gave proof that the show was great. 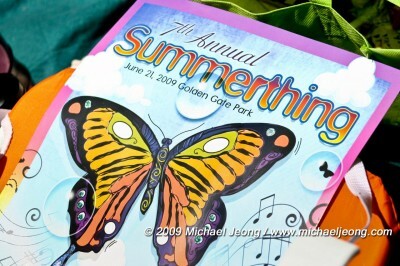 Alice Summerthing 2012 was cool, now let’s look forward to Alice’s Now and Zen Concert 2012 later this year. Do you like bubbles? There were plenty at Alice Summerthing 2012. Vicci Martinez photographing with a fan after her performance. Jamie Scott on the acoustic guitar at Summerthing 2012. Pete Cherry of Graffiti6 on the bass. Graffiti6 duo (TommyD and Jamie Scott) jammin' at Summerthing 2012. Danny Bemrose of Scars 45 on lead guitar and vocals. Scars on 45 Chris Durling bangin' the drums. Stuart Nichols of Scars on 45 lays down the bass beats. David Nowakowski on the keys. Vocalist Aimee Driver of Scars on 45. Martin Johnson of Boys Like Girls on lead vocals and electric guitar. Martin Johnson of Boys Like Girls feeling the energy from the crowd. Martin Johnson of Boys Like Girls better be wearing some Speedos because it can get chilly in SF. Paul DiGiovanni of Boys Like Girls generating energy for the crowd. Boys Like Girls Morgan Dorr on the bass. Adam Lambert's bassist and drummer rockin' it at Summerthing 2012. Hittin' the keys for Adam Lambert. Love the reflection on Adam Lambert's shades. Tommy Joe Ratliff on Electric Guitar for Adam Lambert. Adam Lambert and his fierce stare. This year Radio Alice did not fail to put on a good show. It was anything, but dull. Summerthing has to be one of summer’s best free concert open to the public. 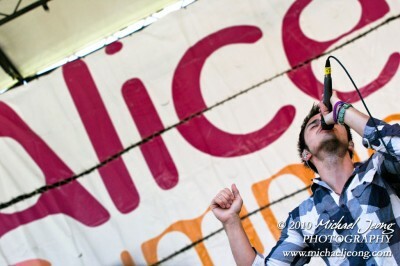 Again the show was held at Speedway Meadows in Golden Gate Park and the featured performers were Thriving Ivory, One eskimO, Kris Allen, and Lifehouse. The weather this year was amazingly sunny and the crowd sure packed the space well. Vendors lined the sides of the venue as well as the far back space behind the audience. People came early to camp out good spots for great views and the crowd sure packed it in at the front of the stage. Great times at the park with great music and tons of blown bubbles throughout the air made for such a great time to have a picnic and time to relax in the sun. Pictures of the Alice Summerthing can be seen by clicking on the picture link above. If this post was informative and helpful, please feel free to leave me a comment or donation below. Thank you. Alice @ 97.3 FM radio stationed put on another great free concert in Golden Gate Park at Speedway Meadows this Sunday. Performing live for the audience were Parachute, Sugar Ray, Matt Nathanson, and Gavin Rossdale. The day was sunny with a cool summer breeze. Thousands of guests lined the grass with blankets and lawn chairs. People picnicked with friends and/or family. There were booths throughout the field that sold food, clothing, arts & crafts, and informational booths. One of the most sought after thing to do at the concert in the park was the flying trapeze. People lined up to try and swing across as if they were in the circus. Safety harness, safety net, and safety line helped insure safety to all that tried. Looks like a lot of fun. I think one reward of going up the high ladder would be the magnificent view from above at the people and concert below. My favorite part of the concert was just hearing Sugar Ray sing. I’ve always heard Mark McGrath on the radio, but I’ve never seen him perform either on television or any type of music video. Having seen him on stage was pretty cool. He was so lively and animated and forever thankful to the crowd for being so into his on-stage presence. Some concerts that I’ve attended when the guest singer/performer ask for audience participation, it usually comes with some hesitation. However, Sugar Ray was able to raise that bar high. Audiences got into it with sing-alongs, clapping, dancing, high pitched screaming, and you can’t forget the yelling of “Your fly is down!!!”. McGrath performed his entire show with his fly down. After a few shouts, he eventually checked his zipper, but in fact the zipper was actually button jeans. He bought his white pair of jeans at H&M and informed the audience to never buy jeans from them or something like this would happen. He wasn’t phased by this little bit of embarrassment and he forged on to perform a great show. The other bands that performed were also great. Hundreds of fans stormed up towards the front of the stage to get a good view. Majority of the forerunners were young women who wanted to see their dreamy guys sing and sweat. Music was great. It was loud and the bubbles were blowing. A few things that I left the day with were a sunburn, suntan, and getting temporarily deaf in my right ear.